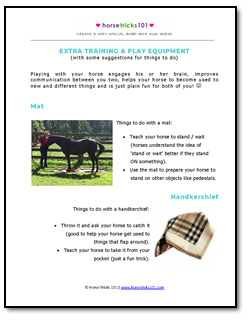 Here are some ideas for equipment and toys that will make training really enjoyable for you and your horse. Most items are cheap and easy to find. (My favorite horse ball only cost $5). 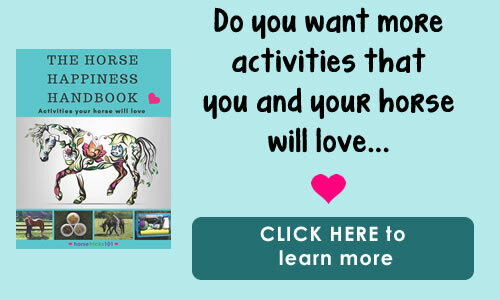 And here is a little gift for you… an eBook with some more of my favorite horse training equipment and toys. Have fun! 🙂 Jain and Trigger. 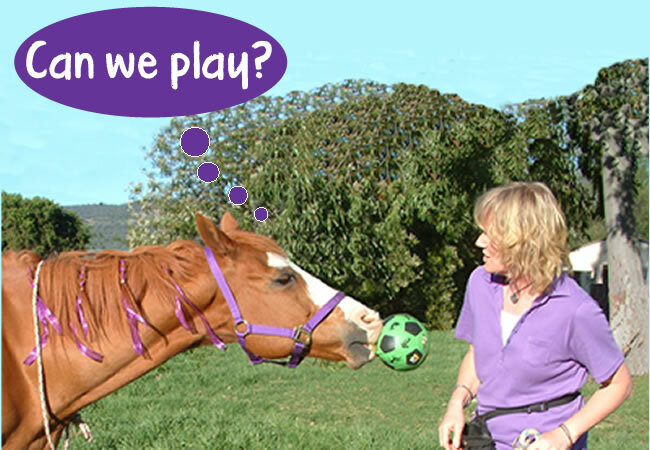 Do you want new and interesting activities every week, for you and your horse? Previous postWhich trick should you teach your horse first? My horses like for me to make them a toy/treat dispenser out of an empty CLEAN 2Liter or 3Liter soda bottle, or Gallon Jug. Choose your treat, cut hole or holes into the jug, insert treats making sure they will fall out when the jug is rolled & pushed around. At First, the holes should be larger & treats should come out w very little effort til Horse gets the hang of it. Alfalfa Cubes are great for this.